Weight loss is hard. I’ve struggled with it a lot. It’s very hard to find the balance between indulgence and discipline. It can be tricky to remain eating healthy. It takes a change in your life style to make it happen. Last year, I counted calories for a period of time, so I could control what I was eating better. And I was shocked to see how easy it is to pack in the calories. I realized sometimes I was easily eating 3000 or more calories in one day! Specially since I bake so much. Counting calories was a learning experience. It forced me to look for substitute ingredients in my recipes that would provide me with delicious food that wasn’t as caloric. It actually went beyond that, it made me understand how certain ingredients affect a recipe. For example, I found out I could use apple sauce or bananas for a good egg substitute in baking, because they act as binders. AND they add flavor as well! When you are counting calories, you pay attention to everything you eat, because you are trying to get the best out of every single ingredient. That’s when I came up with a bunch of low calorie recipes, and this low calorie jalapeño poppers recipe was one of them. I LOVE jalapeño poppers more than life itself. Everything about it is just right! And, trust me, sometimes I am just going to have a breaded and fried jalapeño popper, as it should be. But that will be my indulgence. And since the number of times I want to eat a jalapeño popper is higher than the number of times I should allow myself to indulge in them, I decided to make them this way, no breading, baked, with low fat laughing cow cheese instead of cream cheese and low fat cheese shredded on top. It doesn’t taste the same as a breaded and fried jalapeño popper but it’s a pretty good replacement. Pretty easy to make too. You can assemble and bake later, so it’s great to make ahead, say for when you are having company for dinner. Your guests arrive. They are hungry, of course because they know you cook awesome food so they came prepared to eat. You don’t want to be rude and stand in front of your stove frying jalapeño poppers instead of entertaining your guests. So all you have to do is pop your pre-assembled jalapeño poppers in the oven. Then you pour your guests some wine, and hopefully some for yourself too. 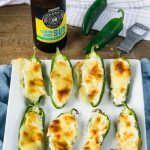 Talk and visit with your guests, and 20 minutes later remove the jalapeños from the oven, serve to your lucky friends and everybody eats cheesy, melty, delicious baked jalapeño poppers and lick their fingers afterwards! And I know I said you should pour your guests some wine, but I’m thinking about it and a beer goes way better with this, and come on, you deserve a beer since you are already eating so healthy!! 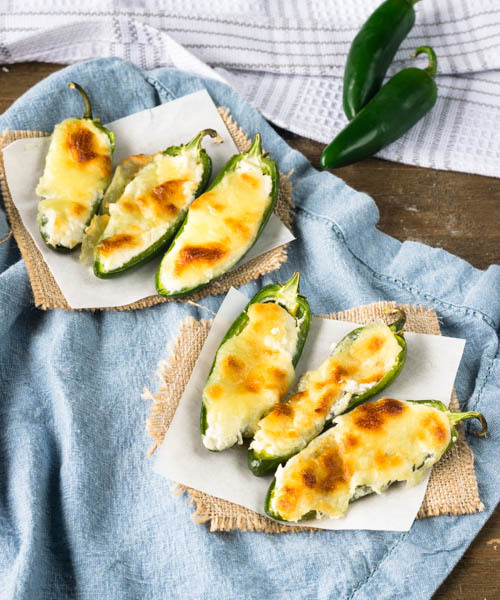 This recipe will satisfy your cravings for jalapeno popper without all the calories in an actual breaded and fried jalapeno popper. I like to use The laughing cow cheese, the creamy swiss light, that has less calories and fat. You can use low fat cream cheese or even the regular kind if you want to. You’ll want to make this over and over again if you, like me, are a jalapeno popper lover but don’t always like to eat fried food. 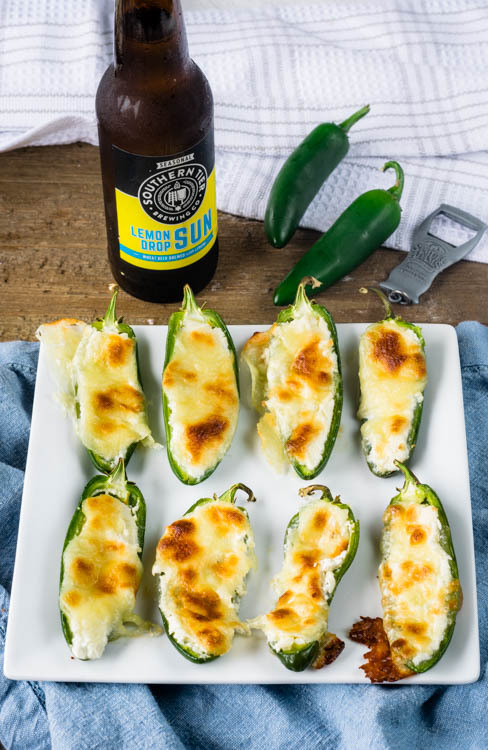 Pre-heat the oven to 350º F.
Cut jalapenos in half lengthwise and remove white membranes and seeds. If you don’t like a lot of heat, make sure to remove all the membranes from the inside of the jalapeno. I like to leave the top stem on because it looks cute and prevents the cheese from leaking once it melts. Sprinkle a tad of salt and pepper over jalapenos. Fill each half of jalapeno with cream cheese, spreading it with a butter knife or a spoon. Sprinkle cheese evenly over cream cheese. 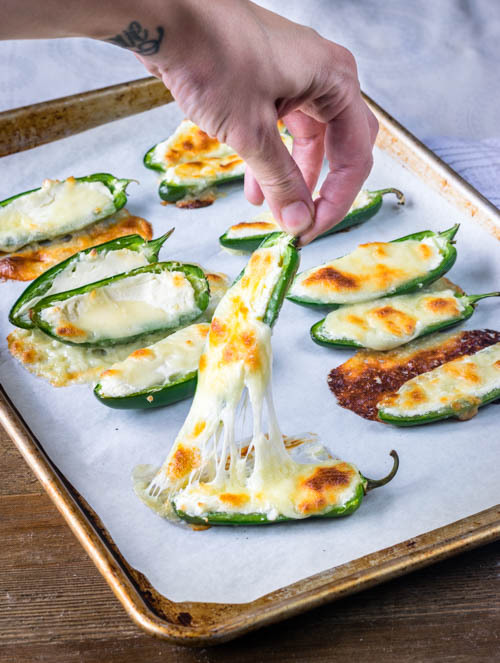 Place each jalapeno half on a baking sheet with the cheese filled side facing up. Bake in pre-heated oven for 20-30 minutes or until the cheese on top is brown. This is so easy and quick and can be easily assembled ahead and kept in the fridge until baking time.